This is the story of Rev. D.G. 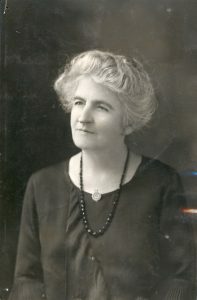 McQueen, one of the most popular ministers in western Canada’s history. 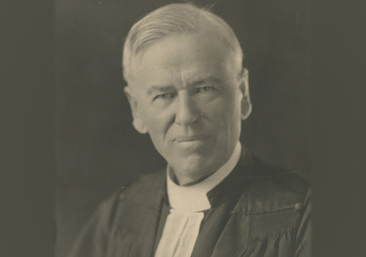 This exhibit was created using records and images available at The Presbyterian Church in Canada Archives, and is intended to present an overview of Mr. McQueen’s many accomplishments as a Presbyterian minister, a pioneer, and as a symbol of Edmonton and the west. Please enter the exhibit using the link below and use the sidebar to navigate through the different pages documenting McQueen’s life. Following in the footsteps of many Scottish immigrants, David George McQueen’s father James came to Canada with his wife Catherine in 1832. 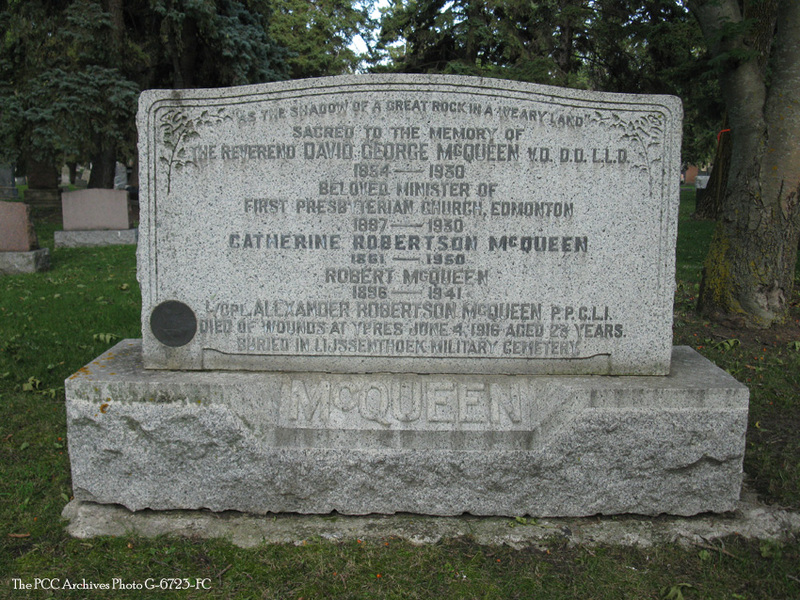 The McQueens immigrated to Canada in search of inexpensive farmland, a dwindling commodity in Scotland’s industrializing economy. The McQueens settled in Kirkwall, Ontario, a small community near the present-day city of Cambridge, and began turning their plot into farmable land. The community of Kirkwall grew, mostly with Scottish immigrants, and a small log church was built to support a congregation of 18 members and their children. The log church served the Presbyterian community in Kirkwall until 1848 when it was replaced by a stone church, which remains in use today. 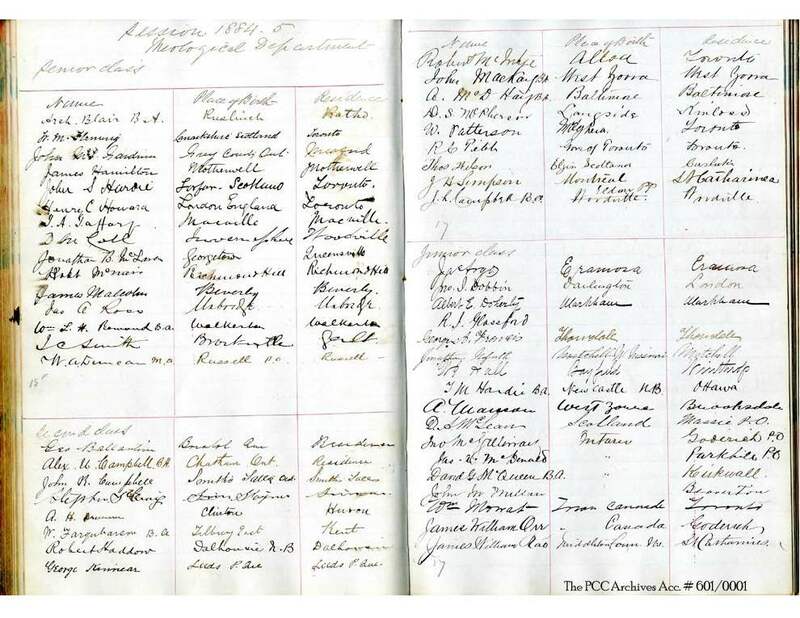 When David George McQueen was born on Christmas Day in 1854, James McQueen had already established himself as an active member of the Kirkwall community and the local Presbyterian Church. 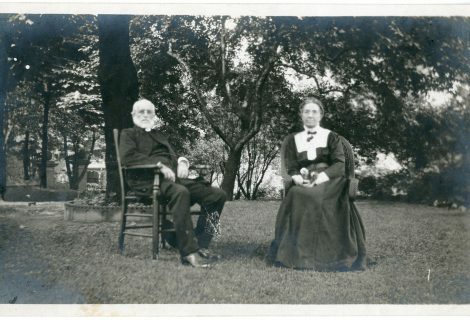 His eldest son Robert served as the Clerk of Session for many years, travelling the unpaved country roads to church with David and his eight other siblings every Sunday for the following 20 years. Despite being raised in a rural setting, D.G. McQueen balanced the physically demanding lifestyle that accompanies farm living by relaxing in his father’s impressive library during his spare time. James McQueen had collected a large personal library and at a young age, David, along with many other Kirkwall residents, took full advantage of his father’s wide collection of literature. The young McQueen’s interest in reading pleased his father, who served as a member of the municipal council of Beverly and became a proponent of proper education for all children through both the public school system and the church. Emphasis on proper education was important for the McQueen children as well; David and his brother both held jobs as school teachers as young adults. When McQueen turned 26, he decided to enter the Faculty of Arts at the University of Toronto where he graduated 4 years later with an honours degree in mathematics. Still, McQueen had not settled on a career and with the advice of his family and the inspiration of his local minister, Rev. 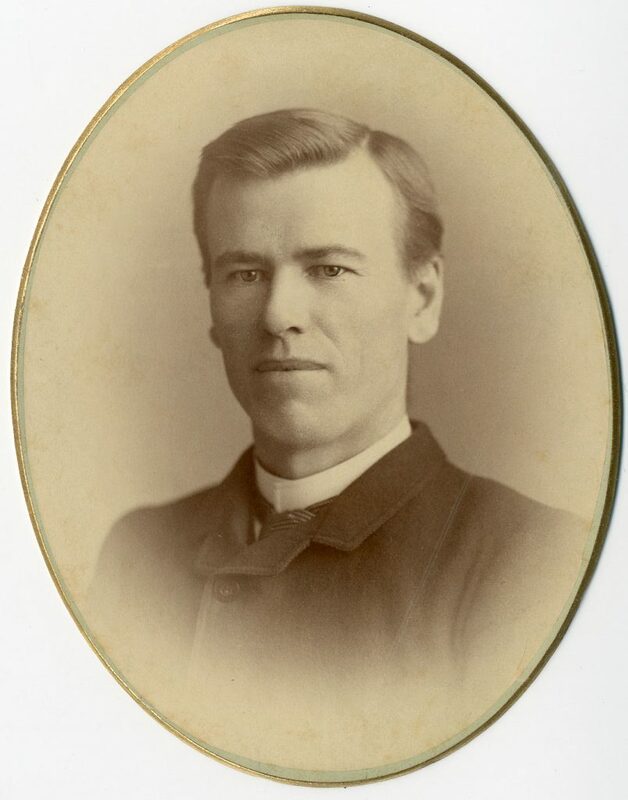 Porteous, he enrolled at Knox Theological College in the fall of 1884. McQueen’s eldest brother Robert remained an active member at Kirkwall Presbyterian Church, and he was convinced that a career in ministry was the best path for the younger McQueen. Rev. 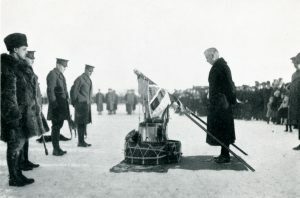 Porteous had provided McQueen with an example of a devout leader and authority who balanced his responsibility as a minister with 23 years of service as the outspoken and hardworking Superintendent of Education for the Kirkwall district. Set on becoming a Presbyterian minister, ‘Dave’ as he was known by his classmates, embraced his classes at Knox College, where he engaged himself deeply in the study of Christian theology while also spending time as a student missionary working in the fields of northern Ontario. McQueen completed his studies and graduated in the spring of 1887. 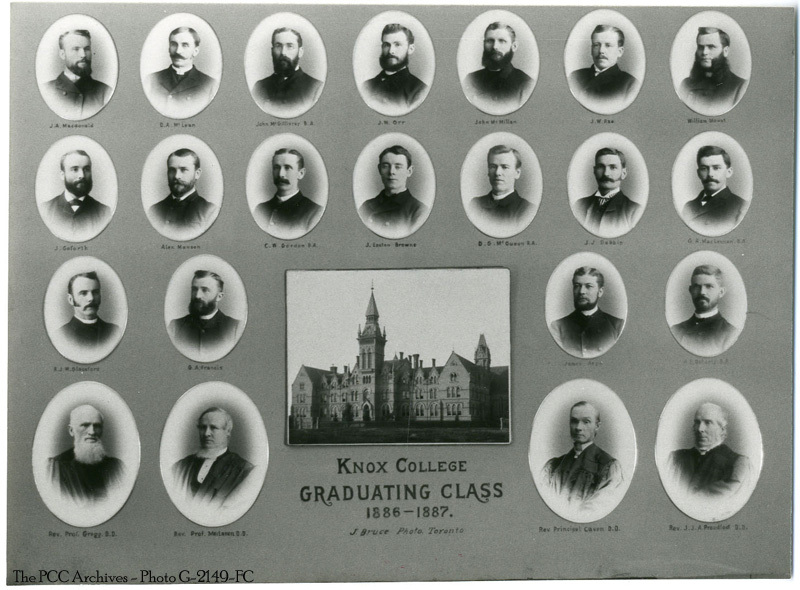 Knox grad. Class, 1887 (Photo G-2149-FC at The PCC Archives. McQueen’s path to western Canada was set in motion by Rev. Dr. James Robertson, the Superintendent of Missions for the West from 1881 until his death in 1902. Robertson had travelled to Knox College during McQueen’s final year of studies to deliver a lecture on the trials of mission work in western Canada. Robertson emphasized the unforgiving land, the lack of accommodations, and even the lack of money for mission workers in the west. He painted a harsh and demanding image of the west, and used the opportunity to scout for potential ministers. When Robertson met McQueen after his lecture and learned of young McQueen’s rural upbringing, as well as his mission work as a student in the challenging mission fields of northern Ontario, he knew he had found his candidate. 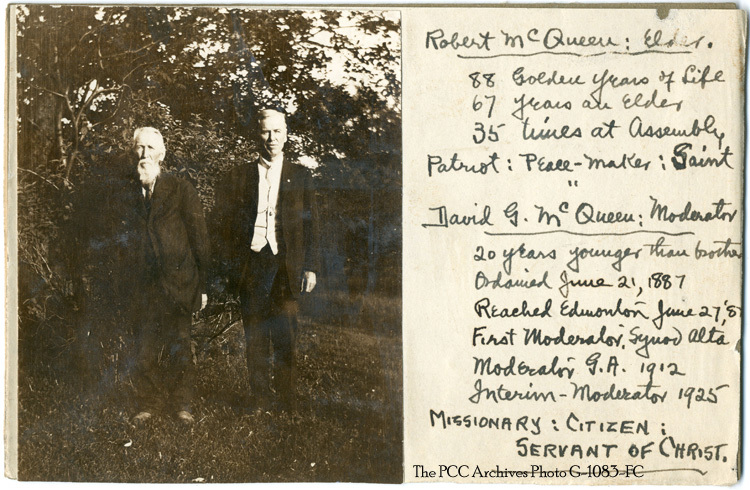 On June 21, 1887, McQueen was ordained as a minister in The Presbyterian Church in Canada and was promptly sent west to fulfill the call of Rev. Dr. Robertson. The Canadian Pacific Railway took McQueen as far as Calgary, where he boarded a stagecoach and made the 5 day journey north to Edmonton. McQueen was soon introduced to Rev. 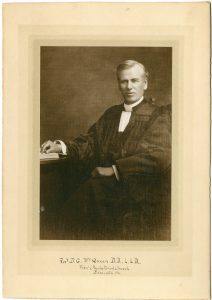 Andrew Browning Baird, who had been serving a small number of Presbyterians in Edmonton since 1881. Rev. 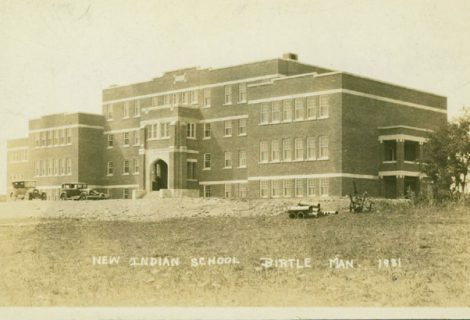 Baird had recently accepted a position at Manitoba Theological College, and once he departed east, McQueen was to take over Baird’s ministerial responsibilities in Edmonton. McQueen’s dedication to building the church and his enthusiasm to help construct a place for children to be educated strongly reflect the values instilled in him as a youth. While completing his work in the mission fields, McQueen succeeded Rev. 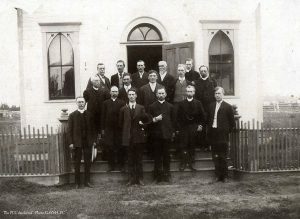 Baird on June 27, 1887 as the minister of First Presbyterian Church in Edmonton, a growing congregation that had been conducting services in a modest-sized wooden church since 1882. 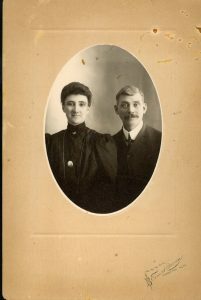 Before the end of his first year in Edmonton, McQueen had also been appointed Inspector of Schools in Edmonton. 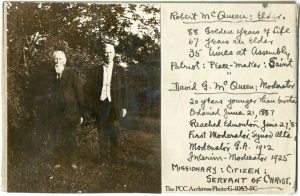 For the next several years, McQueen balanced his pastoral duties at First Presbyterian Church in Edmonton with his regular visits to the surrounding mission fields and his additional obligations to local schooling. In June of 1889, McQueen left Edmonton for the first time since his arrival in order to attend The Presbyterian Church in Canada’s General Assembly in Toronto. McQueen reached southern Ontario in time to see his father for a final time, as Robert McQueen had fallen ill and died shortly after his son arrived home. Though the trip was marked by the death of his father, McQueen also met a young woman named Catherine Robertson, who like David, had grown up near Galt in southern Ontario. The two were married on September 23rd of the following year, and returned to Edmonton together that same fall. 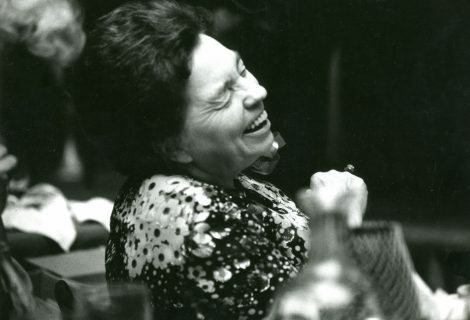 Catherine McQueen was immediately popular amongst the people of her husband’s congregation. She welcomed the congregation into their home, hosting choir practices, Ladies’ Aid Society meetings, and numerous church committee meetings, making the McQueen home into a welcoming space for the whole congregation of First Presbyterian Church. David and Catherine had 7 children: James, Alexander, Marjorie, Robert, Christina, Jean and Helen. The two eldest, James and Alexander, joined the Army and were sent to Europe during the First World War, but only James returned. 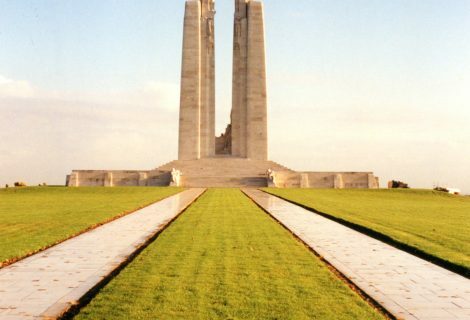 Alexander was killed on June 4, 1916 at the Battle of Sanctuary Wood in Belgium. McQueen learned of his son’s death while on the train home from that year’s General Assembly in Winnipeg. McQueen was devastated upon hearing the news. The McQueen family restrained their emotions in public, but speaking many years later his daughter Helen revealed that she, even at a very young age, saw how troubled her father was over the loss of his son, and claimed that he never fully recovered from his death. McQueen became a fixture in all civic affairs during his time in Edmonton. He grew to love the city, and had continuously refused offers to preach in more established communities. McQueen was not a typical Presbyterian minister of the time, but a gentle and fun-loving man who enjoyed a good joke – even if it was at his own expense. McQueen tolerated tobacco and alcohol consumption in moderation, but did not smoke or drink himself. Knowing this, his friends played light-hearted pranks on the minister from time to time. One of those stories is told in E.A. Corbett’s book McQueen of Edmonton (1934). As McQueen continued to help the growing community deal with education and civic affairs, his presence as a symbol of Presbyterianism in the west began to be recognized by his peers. 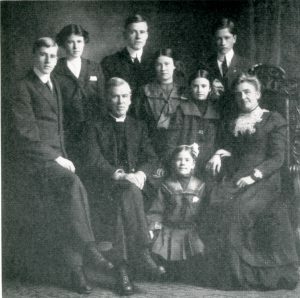 McQueen became Moderator of the Synod of Alberta in 1907, and also received a Doctor of Divinity degree from Knox College in 1905. He worked intensely on ecumenical relations, ensuring close partnerships with other denominations, whether it be sharing a space of worship, or gaining funding for events. In fact, one of Dr. McQueen’s closest friends was the first Anglican Bishop of Alberta, Right Rev. Henry Allen Gray. Shortly after McQueen arrived in the west, the railway connecting Edmonton and Calgary was completed, opening the northern settlement to more commerce and trade. Edmonton’s population began to grow steadily, and as a result McQueen found himself not only as a spiritual leader, but also as a lobbyist for the interests of the west. A good supply of coal was discovered near Clover Bar, and McQueen helped Presbyterians in eastern Canada invest in the new mine. 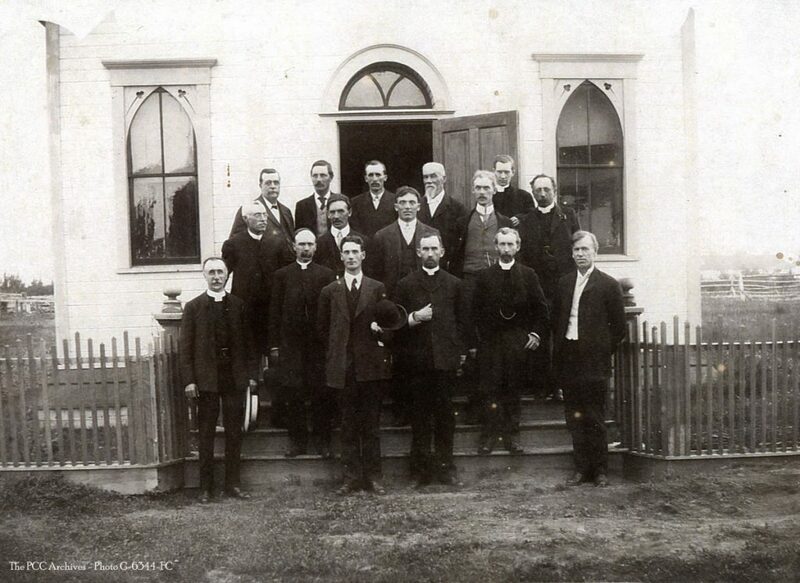 The dividends from the mine were then used to help the Presbytery of Edmonton in its mission work. McQueen became vocal at Synod meetings and the General Assembly, petitioning for increased attention and funding to be made available to the mission efforts in the west. 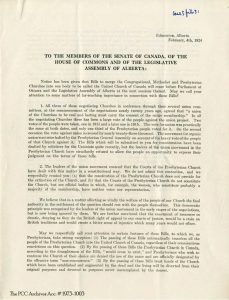 McQueen’s work for the Presbytery of Edmonton and the Synod of Alberta was recognized in 1912 when he was elected Moderator of the 38th General Assembly. 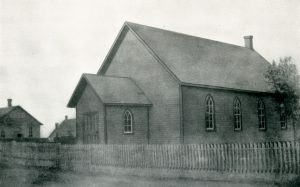 McQueen used his authority as Moderator to further publicize the challenges and accomplishments of The Presbyterian Church in Canada’s western mission, and grew to be such a prominent symbol of his community that he was given the informal title “McQueen of Edmonton”. 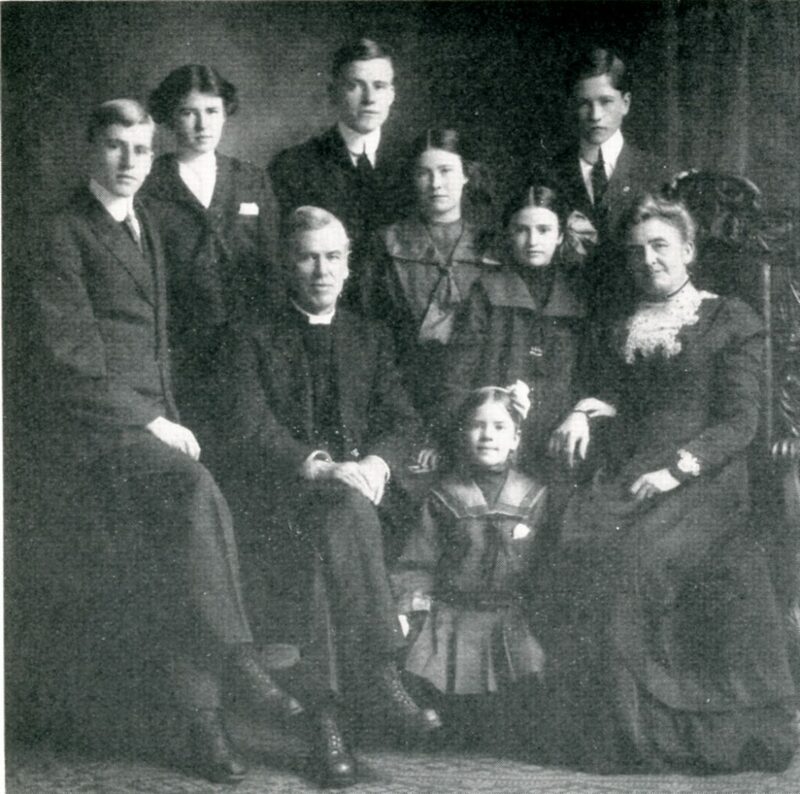 Dr. McQueen’s influence in the community became apparent during the church union movement in 1925. 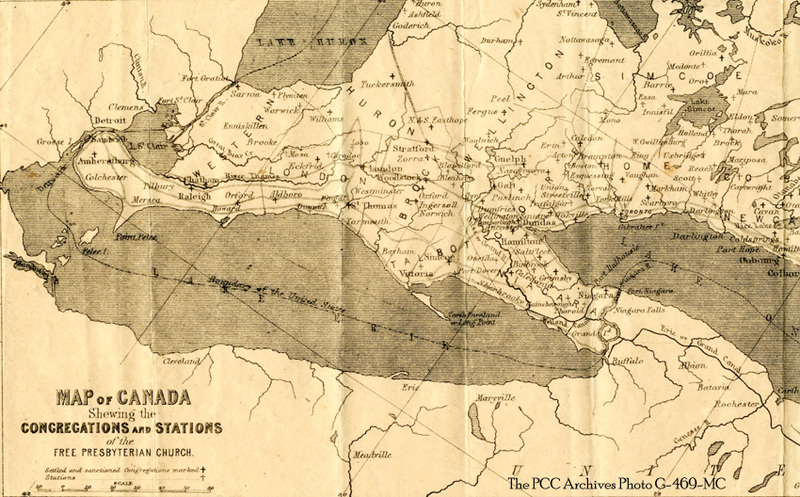 Communities in western Canada and the churches that served them were often scattered and difficult to reach, placing a great burden on ministers from various Protestant denominations who had to travel great distances between their charges. 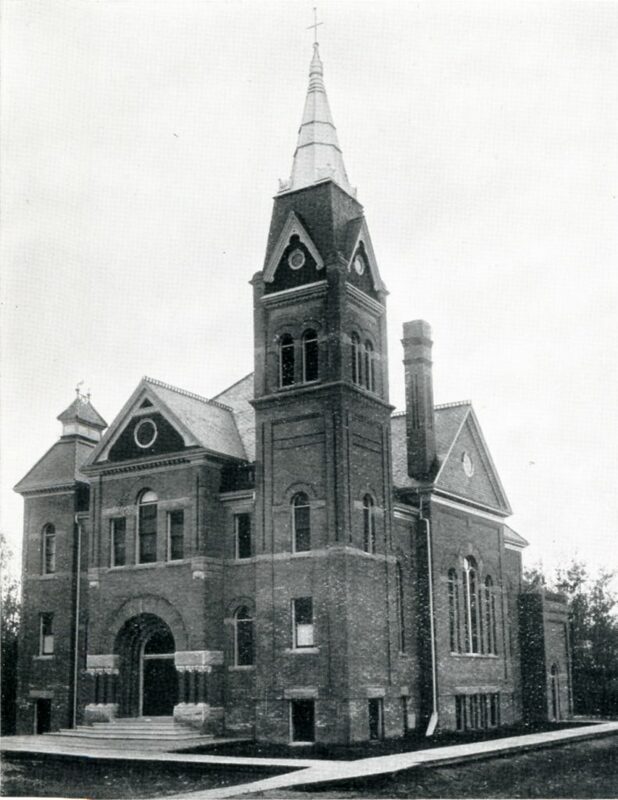 The costs associated with the western missions also drained the financial resources of eastern churches that had to support infant congregations until they became self-sustaining. One of the advantages of the proposed church union was that Protestant denominations could join together to reduce duplication of effort, and thereby ease the costs of supporting multiple Protestant churches in the single community. 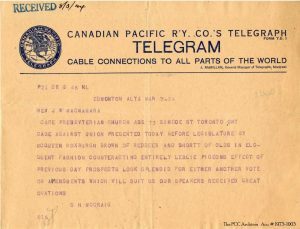 When the matter was brought to a vote, the majority of The Presbyterian Church in Canada’s congregations joined with the Congregationalist and Methodist churches to form the United Church of Canada. 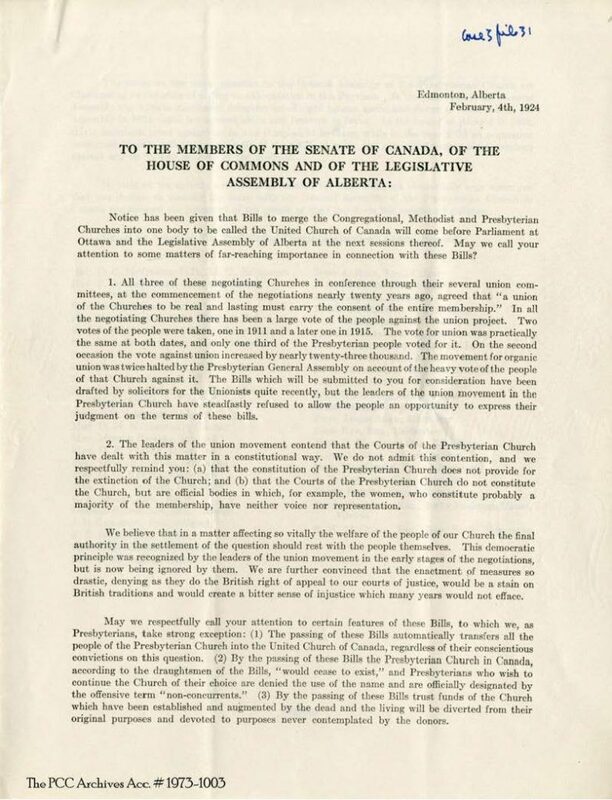 In Alberta, however, McQueen promoted his view that proper ecumenical relations and annual meetings between the Protestant denominations was enough to keep costs down, while also preserving The Presbyterian Church in Canada as an independent institution. McQueen had been a strong advocate of co-operation between Protestant denominations, but his beliefs against church union ran deep. McQueen joined the Alberta branch of The Presbyterian Church Association, a group fighting to maintain the rights and property of The Presbyterian Church in Canada for its continuing members. 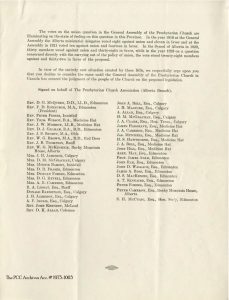 His authority as a symbol of Presbyterianism in the west gave other opponents of church union in Alberta a powerful leader, and when it came time to vote on the matter in 1925, many of the Presbyterian churches in Edmonton and the surrounding areas chose to remain Presbyterian despite great pressure to join the United Church of Canada. 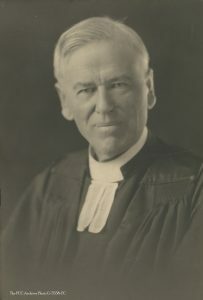 In a move telling of McQueen’s status and respect amongst his peers, he was voted to serve as Interim-Moderator of the 1925 General Assembly for the continuing members of The Presbyterian Church in Canada. 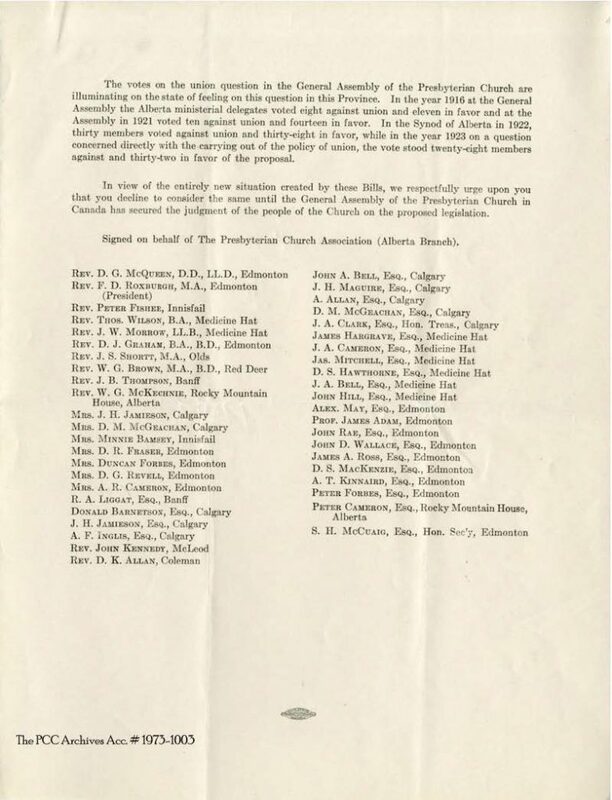 A memorandum published by members of the Alberta branch of the Presbyterian Church Committee Identifying many of the issues raised by the prospect of church union. “His life was a great moral and spiritual achievement of the rarest order and the highest type”. Dr. D. G. McQueen dies in Edmonton, October 22,1930. Corbett, E.A. (1934), McQueen of Edmonton, The Ryerson Press: Toronto, 125p. Bush, P. (2000), Western Challenge: The Presbyterian Church in Canada’s Mission on the Prairies and North, 1885-1925. Watson Dwyer Publishing Limited: Winnipeg, 272p. 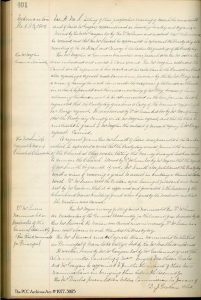 Grant, R.J.S. (2007), Helen Learmonth’s Reminiscences of Early Edmonton. 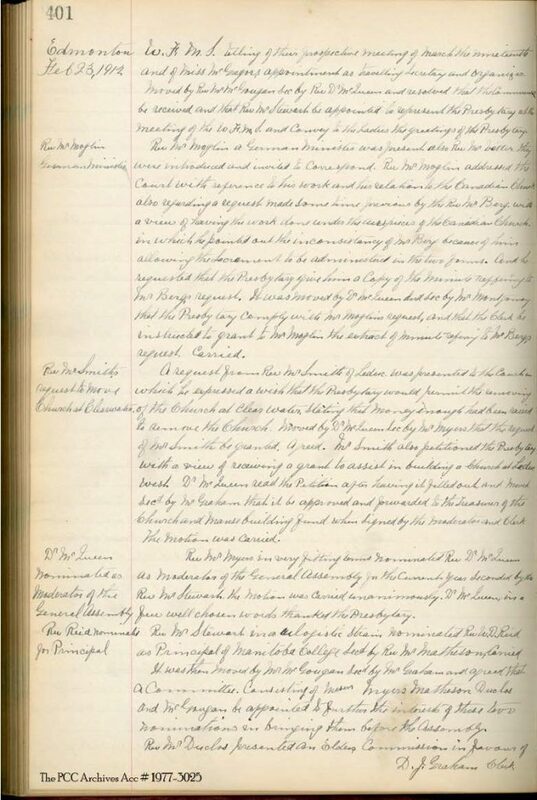 In Presbyterian History 51(2). Ed. Bush, P; Winnipeg. Roxburgh, F.D. (nd). 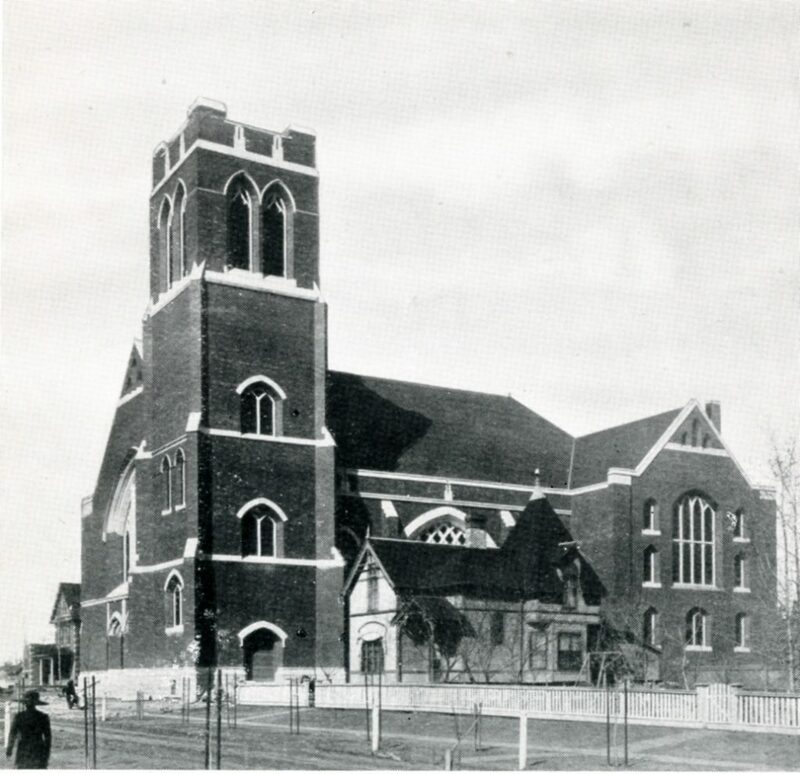 History of the Presbyterian Church in Edmonton 1866-1940. This Project has been made possible [in part] by the Government of Canada through the Young Canada Works and Heritage Organizations Program. « Ce projet a été rendu possible [en partie] grâce au gouvernement du Canada par de Jeunesse Canada au travail et le Programme des organismes patrimoniaux». This exhibit was created by the Archives summer intern, Tys Klumpenhouwer.